After months of speculation and continued trailling in the opinion polls Australian PM John Howard has announced that a General Election will take place on 24 November. 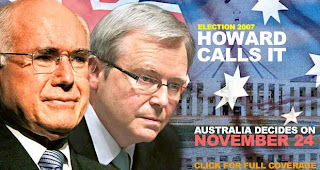 Howard is expected to be trounced at the polls by his lap dance visiting opponent Kevin Rudd. This one is going to be nasty......Howard has a rep for being a grumpy git, sucked up too much to the US and has committed Australian troops to the 'War on Terror'. The Sydney Morning Herald has more details. It is looking like a slaughter, in fact the polls have been all but identical to 1996 for a year now (though Rudd's approval rating is ridiculously high and Howard's hasn't significantly changed in 11 years). Howard needs a miracle here, and I think this time his luck has run out.